The foundation of this series will be both cutting-edge contributions on emerging topics and definitive reviews of keystone topics in public and nonprofit administration, especially those that lack longer treatment in textbook or other formats. Elements within the series are fast tracked after formal acceptance, updatable, accompanied by the latest functionality by being hosted on Cambridge's new institutional platform (Core), as well as being available via low-priced POD. They will appeal to scholars, graduate students, and practitioners demanding short and accessible introductions to emerging or keystone topics. 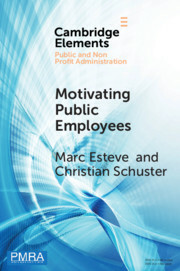 Among keystone topics of interest for scholars and practitioners of public and nonprofit administration, we are interested in contributions in the areas of public management, public budgeting and finance, nonprofit studies, and the interstitial space between the public and nonprofit sectors, along with theoretical and methodological contributions, including quantitative, qualitative and mixed-methods pieces. Among emerging topics of interest, we are interested in cutting-edge contributions that push the boundaries of our field.